Pears have come into season, and are ripening beautifully on the kitchen counter. 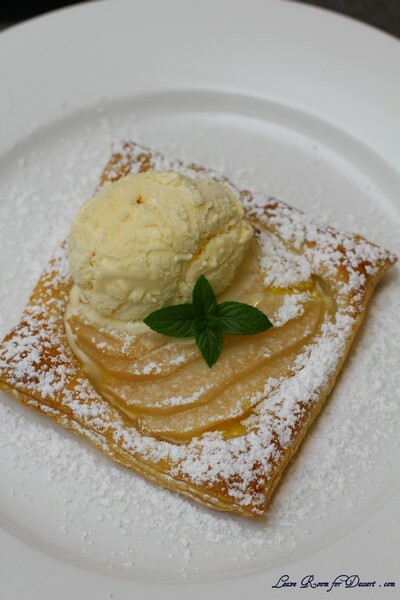 This tart is quite easy to make, with the custard being able to be prepared far in advance, and just cut the pear up soon before baking (to prevent browning of the pear). The pear is not pre-cooked, so retains the fresh pear flavour, so make sure it is a nice ripe and firm pear you choose for your dessert. 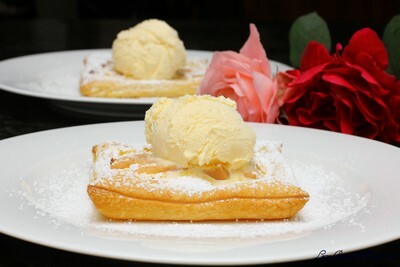 The dessert combines crispy pastry, creamy rich hot custard, fresh pear and cold ice cream. I hope you enjoy. I have entered this into the “What can you pear with a pear” challenge run by the Australian Pear Industry. Although I may not have gone far out of the box (or out of the box at all), I am certainly happy with how this recipe turned out, and managed to make it three times this month. 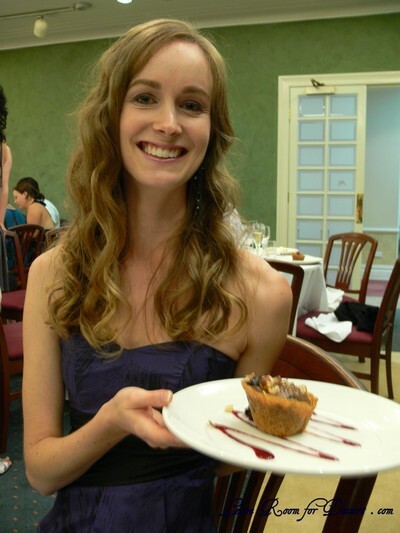 I hope you enjoy this recipe and the others that have been entered into the competition. To prepare custard, heat milk and vanilla bean pod and seeds in a small saucepan over medium heat until warmed (if using vanilla essence, add at the very end of the custard recipe). Whisk together the egg yolks, sugar and cornflour in a small/medium bowl, until lightened in colour and thickened. Slowly pour in the warm milk while whisking the yolk mixture. Strain this mixture back into the saucepan, removing the vanilla pod. Heat over medium heat, whisking constantly until the custard has thickened. Remove from heat and pour into a bowl (add essence at this point if you are not using a vanilla bean). Place plastic cling film over the custard, touching the custard to prevent a skin forming. Refrigerate until required. 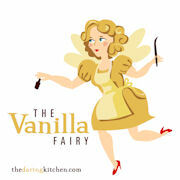 (The custard can be made 1/2 hour, or even a few days, before using). 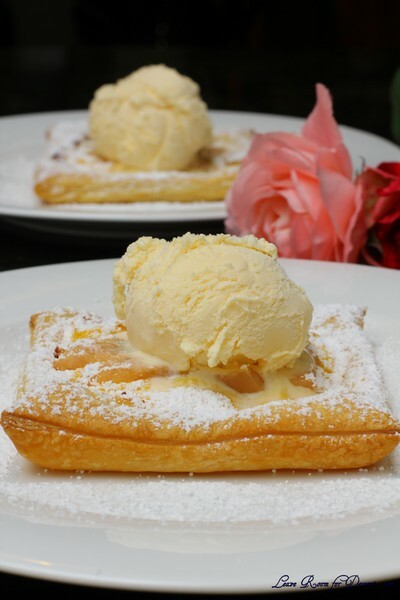 Place squares of puff pastry on one or two baking trays with baking paper. 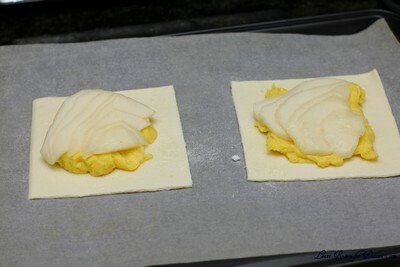 Place the custard in the middle of the pastry squares, leaving an edge of 2cm. Fan out the thinly cut pear slices over the custard. Bake for 20-25 minutes (checking after 10-15 minutes, and rotating if necessary). Remove from oven and allow to cool for 5 minutes, place on plate and dust with icing sugar and serve with a scoop of vanilla ice cream. Filed under Dessert, Egg Yolks, Recipes. You can follow any responses to this entry through the RSS 2.0 feed. You can leave a response, or trackback from your own site. 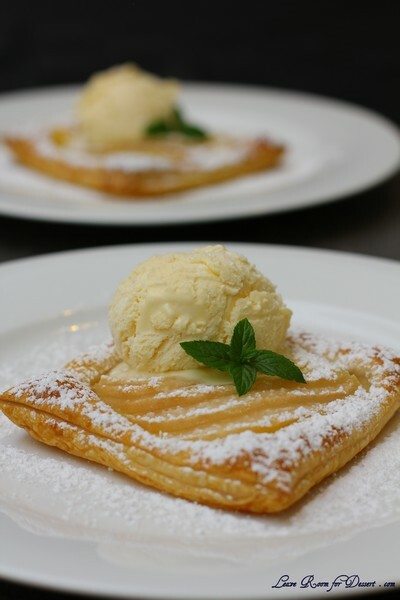 I’ve seen a couple of pear recipes for this competition now and yours looks especially delicious…love the beautiful arrangement of the pears and that delicate pastry. Beautiful! 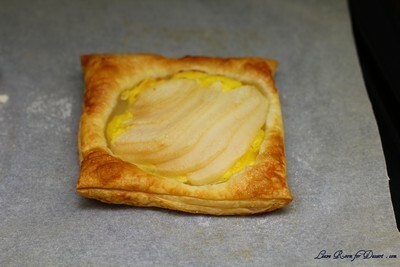 From the picture I thought that you had an extra bit of pastry on top with a whole cut out to make a sort of ‘well’ for the custard and pear, but it’s interesting how the edge bits just puffed up more to create the ‘well’ naturally. nice pics they all look so delicious !